This recent photo shows the 22-km Kalkalwa embankment built in the Bagauda area of India just across the border. The man-made structure has been blocking the natural flow of water during monsoon causing inundation in large swathes of land in Nepal. NEPALGUNJ, Aug 5: The ambitious river-linking project of India has turned out to be a huge disaster for Nepal, causing erosion of large chunks of land, loss of soil fertility and loss of habitat because of the subsequent flooding. As a consequence of the Laxmanpur dam built on the Rapti river just across the border and the 22-km Kalkalawa embankment in the Bagauda area of India, over 2500 bigha of land in Nepal has been corroded, 4000 bigha of land has lost its fertility and more than 60,000 people have been directly affected by the floods. 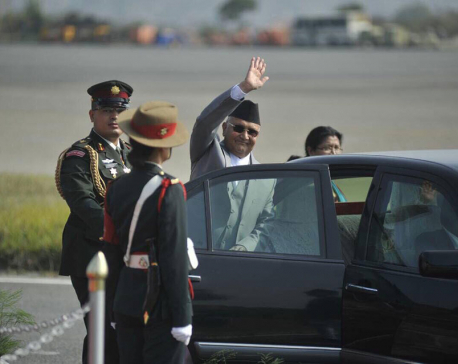 “India has been constructing dams and embankments in the name of security of its land, thereby submerging Nepal. It is a serious breach of existing international laws,” Jagdish Bahadur Singh, the president of Laxmanpur Dam Victim Struggle Committee, said. 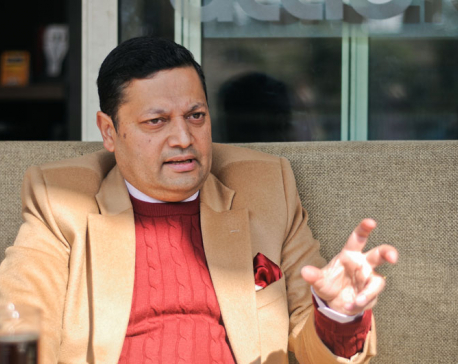 “Unfortunately, government of Nepal and stakeholders are mere spectators and have remained mum about the disaster resulted by the dam,” he said. Not just in Banke district, India has constructed over 16 dozen dams and embankments over most of the rivers flowing from Nepal to India. According to Buddhi Narayan Shrestha, a border issue expert, the National River Interlinking Project of India comprises of 30 links to connect 37 rivers across the nation through a network of storage dams to form a gigantic South Asian Water Grid. Though the concept of the project was developed in the British era, the focus of project was brought back into the limelight only since the last few years. The Sharada barrage in Mahakali river of Kanchanpur district was also build during the British era and every year during the monsoon the authorities close all 32 channels putting Nepali people in total despair. “Every year, the villagers have to evacuate their residents for some days to save their lives after the water level in the river swells,” Bhairav Bhatta, a teacher from the affected area in Bhujela, said. The victims of such flooding in Banke have sought compensation from the Indian government and urged the government of Nepal to negotiate with neighboring country to fulfill their demands related to compensation. 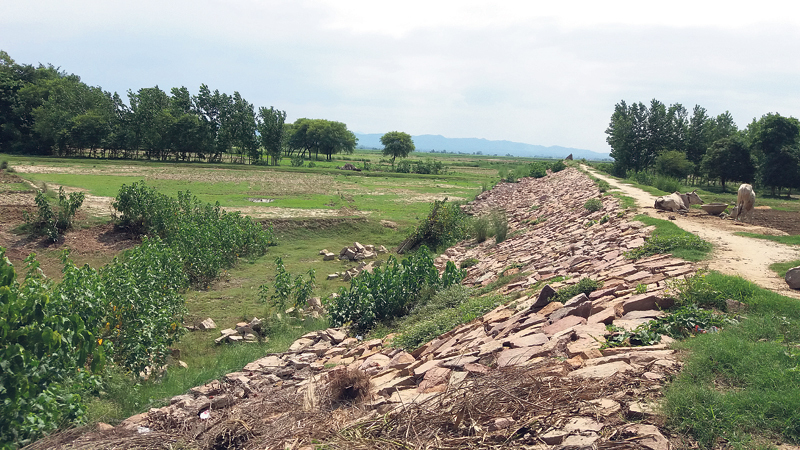 In the eastern region of Kanchanpur district, two other dams - Kailashpuri and Gopiya - that were constructed in the Mohana river haunts the livelihood of the people every year. Both these dams cause havoc in over three dozen villages in Bardiya every year. Ram Kiran Tharu of the same village has similar story to tell. “We get attention only during the monsoon season but once it is over, neither the government nor other bodies care about our problems,” he said. 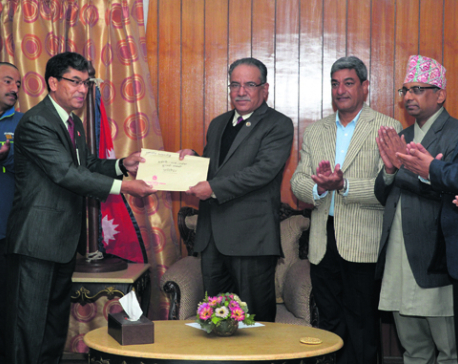 Tharu opined that high-level talks should be held with Indian counterparts to resolve the long-pending problem that has been troubling hapless villagers. Every year, Nepal faces serious problems of flood, soil erosion and loss of fertile land in the plains due to the construction of dams by India. Mahali Sagar dam in Kapilvastu, Dandafarena dam in Rupandehi, Bhujahawa dam in Nawalparasi, Bagmati and Raatu dam in Rautahat, Harkatti dam in Siraha, Luna dam in Saptari, Gandak and Koshi dam in eastern Nepal have caused lots of trouble to the Nepalis. “All political leaders and party are aware about the man-made problem but no one has the courage to speak against the devastation with India,” the related experts complained.